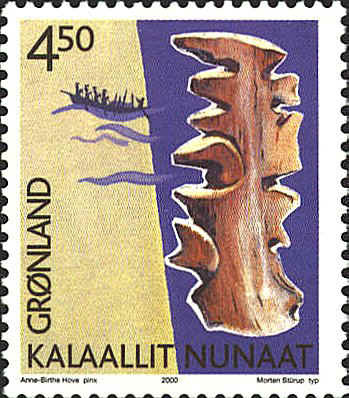 In 2000 Kalaallit Nunaat (Greenland) issued a stamp with a wooden man as a part of the Cultural Heritage series. "...wood was, and is, the most distinctive medium used by the Greenland Eskimos in mapmaking. Blocks are carved in relief to represent the rugged coastline of Greenland with its fjords, islands, nunataks and glaciers, the shapes of the various islands being linked together with rods. In order to reduce the size of the blocks, the outline of the coast is carried up one side and down the other." Three-dimensional maps of coastlines were carved of wood as long as three hundred years ago. These Inuit charts were usually carved from driftwood and are made to be felt rather than looked at. The land is very abstract. It is limited to "edges" that can be felt on a dark night in a kayak. Since they are made of wood they are impervious to the weather, and will float if there are dropped overboard accidentally. The map on the stamp is shown in Plate II of Bagrow's book. The stamp shows a map of Greenland and a portrait of King Frederik IX of Denmark from 1947 to 1972.